Nice banner + ad combo. JWT Sydney has launched a digitally-led campaign for Nokia to promote its messaging smartphone range to the youth market. The campaign - Nokia Bill Exchange turn 'bills intro thrills' - gives consumers the opportunity to convert a 'boring paid bill' into something great and more useful. 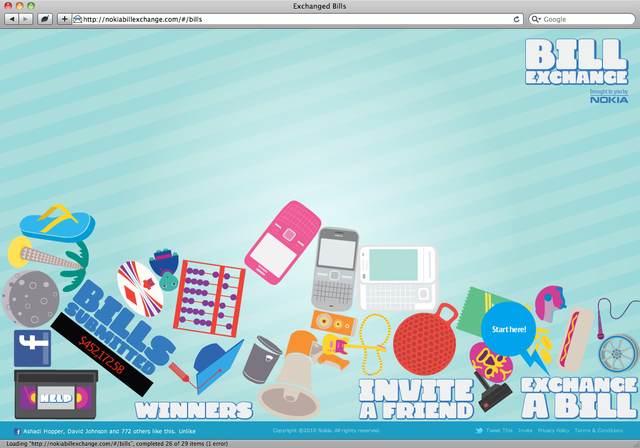 Users simply visit the Bill Exchange nokiabillexchange.com and tell Nokia what they'd rather spend their money on. The more outlandish or obscure the idea, the more likely they are to be winners. The three most creative entries each day are selected and their bill value exchanged for something special up to a value of AUD $300. They'll also receive a new smartphone from Nokia's messaging range. After launch, one of the first winners wanted to go to the moon. A stretch for his $290 bill. Nokia awarded him a NASA training day at Luna Park Sydney which included a flight around the moon on the 'Moon Ranger' and zero-g testing on the 'Rotor'. He was also given a new Nokia C6. Other initial Bill Exchanges include a guy "sick of Twilight vampire-types picking up the ladies" who was given the opportunity to be "picked up" in a giant Skill-Tester. Other bills were exchanged for a giant igloo, an army of plush Zombies and a chest and stomach wax. The campaign makes extensive use of Facebook through news feed messaging and allows users to invite their friends to also apply to have their bills exchanged. 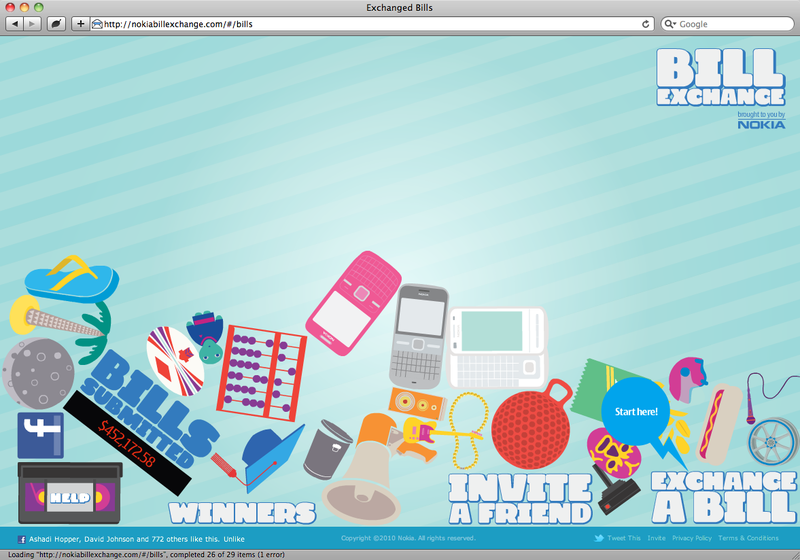 "The campaign is designed to truly engage young people with the Nokia brand. We've created an innovative user interface that brings social functionality to a Flash-based site. Using Facebook Graph brands can go beyond Facebook Pages to create their own socially connected sites," explained Ashadi Hopper, National Creative Director, Digital JWT Australia. Nokia senior marketing manager Adam Johnson, said, "We know our target age group for Nokia's messaging smartphone range don't have a lot of disposable money and the money they do have tends to go on needs as opposed to wants". "With the Nokia Bill Exchange we are exchanging bills for something great. JWT has helped us create a campaign that is really connecting with the target market for our messaging smartphone range," continued Johnson. Nokia Bill Exchange executions include: online social media and display advertising; university posters and or digital panels at 37 campuses nationally; street press and MX newspapers. It's almost that time of year when I spend countless hours collecting the agency and brand xmas cards sent around. It started small in 2005 with just a series of links. In 2008 I spent pretty much the weekend collating 120+ ecards for agencies. And last year I went even further with 130+ and wasted probably 3 days of my life putting this xmas link bait piece on advertising agency Christmas cards together. if you want to save us even more time also send a 550x322 sized jpeg with your submission also. I leave you all with this inspirational video. Now available on DVD for secret Santa's everywhere. 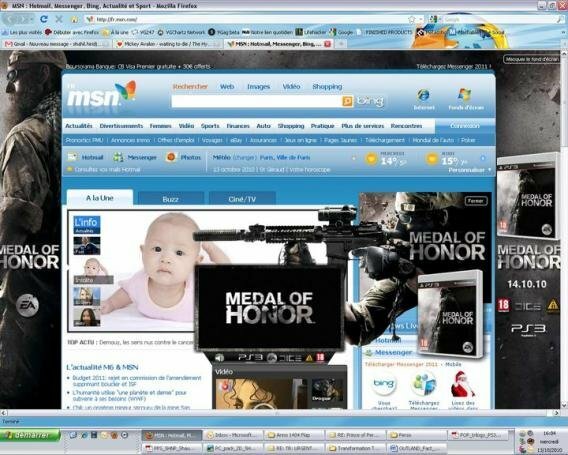 Another unfortunate banner placement, this time for Medal of Honour. Guns and babies never mix well. Gun baby on Google images is even sadder.